Back in August, when Commentator’s retirement was announced, I wrote a column for the Saratogian expressing my wish for an upstate New York home for retired Thoroughbreds. 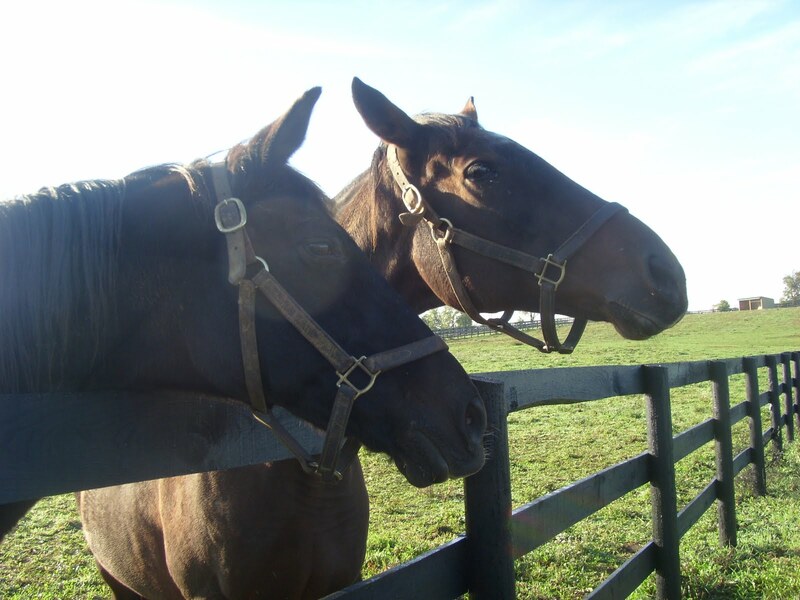 Through various channels I hear that perhaps such a home is in the works, but for now, the two biggest retirement farms are located in the Bluegrass: the Kentucky Horse Park and Old Friends. And so, if our favorite race horses aren’t going to have a home here, where we can see them, I guess we just have to go there. So go there I did, on my most recent trip to Lexington. As always, Michael Blowen was the most gracious of hosts; a friend and I arrived at 8 am, and at 11:30, he was still walking us around, telling stories, jumping into tours and offering anecdotes about the horses who inhabit Dream Chase Farm. While happy to renew acquaintances with some of my favorite horses there—Williamstown, Ogygian, Awad—I was there this time to see Commentator, the New York-bred two-time winner of the Whitney, trained by Nick Zito, owned by Tracy Farmer. And folks…he’s doing great! I’d heard stories about his surliness, but on a crisp–OK, cold–Sunday morning, he was figuratively all smiles, walking over to the fence when Blowen called him, politely and enthusiastically accepting carrots and peppermints, bowing his head for nuzzles. Though he’d obligingly jog/run along the fence line when encouraged to do so, he seemed quite happy to laze around his paddock and accept the adoration of visitors. Even someone as long-winded as I can’t condense a three and a half hour visit into readable length…so instead, here’s the morning in photos, with some commentary (pun intended) that I just can’t bear to leave out. …but when he has to wear something like this, you kind of understand why. 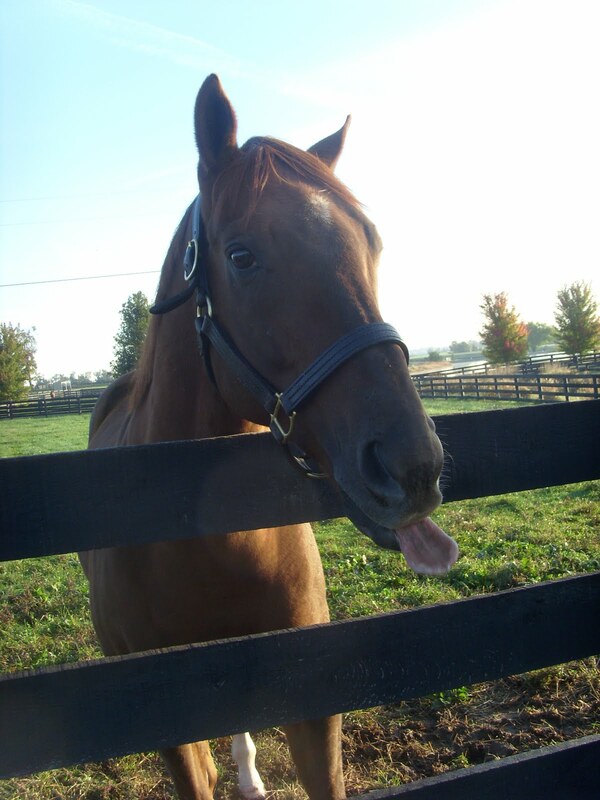 Awad won the Sword Dancer, the Arlington Million, and the Secretariat, and he’s not likely to let you forget it. 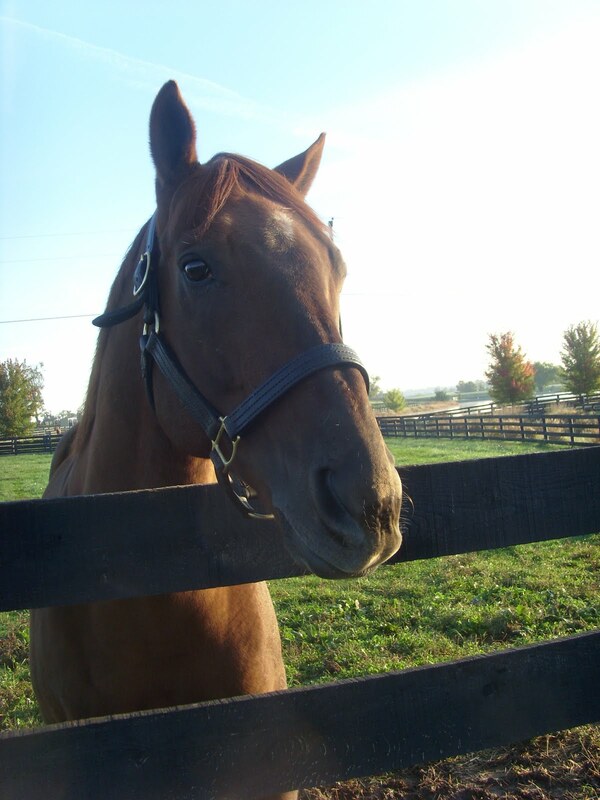 When it was just three of us at his paddock, he was as friendly as could be—carrots, yes; nuzzles, yes. (But no peppermints, thank you very much.) But when the tour group approached…well, it wouldn’t do, I guess, to be so accommodating. He sneezed in my face (much to the amusement of the crowd), then tried to bite me. He dashed off across his paddock, and he reared, up on his hind legs for endless, endless moments…then off his 19-year-old self ran. But no matter how much he showed off, he couldn’t deny that the horse just steps away from him, the one whose paddock is closest, is the horse who beat him by a neck in the 1995 Sword Dancer. Sorry, Awad…but Kiri’s Clown did beat you that day. by a half-length and I wasn’t sure that my filly would be able to battle back. honored to be a part of that. This video of the race includes commentary by Migliore. 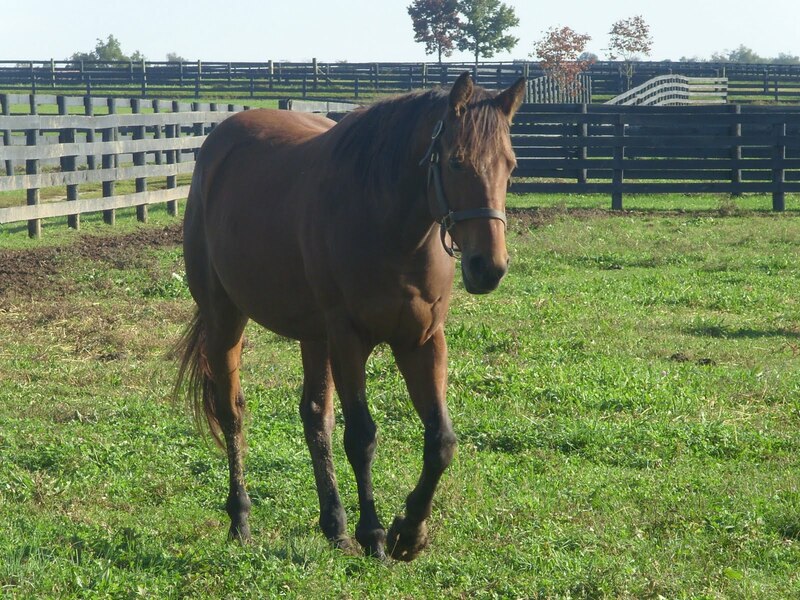 Hidden Lake shares a paddock with Bonnie’s Poker, the dam of Silver Charm. They appear to be inseparable. He might be forgiven for wanting to leave all New York memories behind, but Escapedfromnewyork, rescued from the Paragallo farm upstate, is apparently not quite ready to declare himself a Kentuckian. Blowen points out that the four-year-old bay gelding none too hospitably ripped up the “Kentucky Proud” sign that adorned his paddock. He’s healthy and fit, and perfectly socialized; he comes when you call, and shows no trepidation around humans. 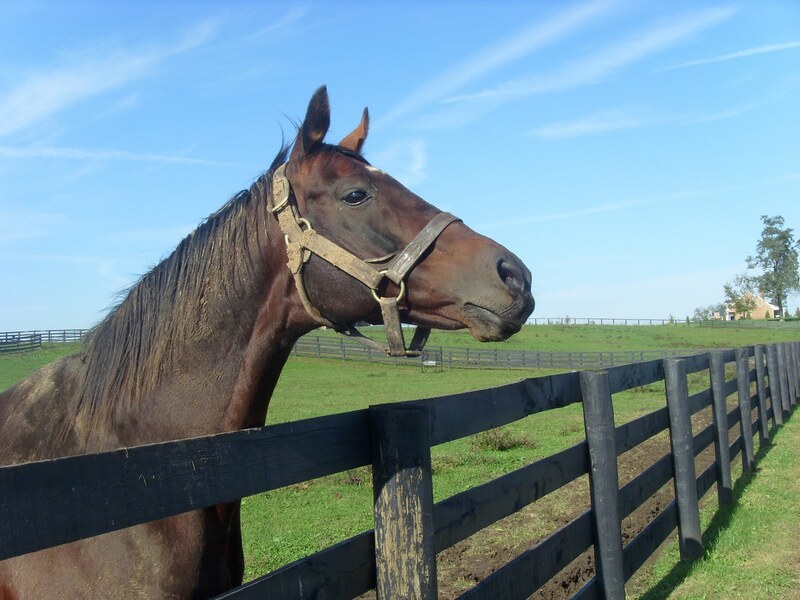 While neglected, he was not abused, and he’s taken easily to life in the Bluegrass. As we wandered around, the 10 am tour showed up; dozens of folks made their way around the farm, hearing stories about the horses, feeding them treats, petting them. These tours are free: on my three visits to Old Friends, I’ve probably spent more than ten hours there, and no one has ever asked me for a dime. The horses and this farm exist because of generous donations from those in the racing industry and from racing fans. The dozens of horses there are well-cared for and happy, guaranteed a happy retirement until the time they join Precisionist, Ruhlmann, Fraise, and others in the Old Friends cemetery. You can help in a number of ways, from volunteering, to shopping at the Old Friends store (in person or online), to sponsoring horses or waterers or paddocks, or simply by making a donation. Click here to find out more. Thank you so much for taking me on a trip to Old Friends through your pictures and words. It is the one place that I would love to visit. I read Val's blog every week and look forward to hearing about each and every one of the beauties that make Old Friends their home.Michael Blowen must definitely be one very caring person. Since 1984 – Wallkill NYhttp://www.trfinc.org/Wallkill-Correctional-Facility-c17.htmland many,many private barns host retired horses. Just google it. Nice article – I had a nice visit last Sunday (Oct 11th) when returning from opening weekend for Keeneland. Michael is one of the nicest, down to earth, sincere cheerleaders of these horses. He gave a large crowd of us a tour of the facilities and horses. While it likely was the same anecdotes he has for hundreds before it was genuine. He was very choked up speaking about Precisionist's last days that it put even a lump in my throat hearing it. However he was so relaxed as could be and without any "selling" to us but just appreciate these horses. (Already preaching to the choir, of course)When I fed Commentator some carrots he was polite and not rude as suggested with being nippy. He simply seemed relaxed which for a horse just 2-month or so since being in a Grade 1 race is impressive. He already had a coat and was settling in just fine to the retired life. Jean–thanks for the kind words. 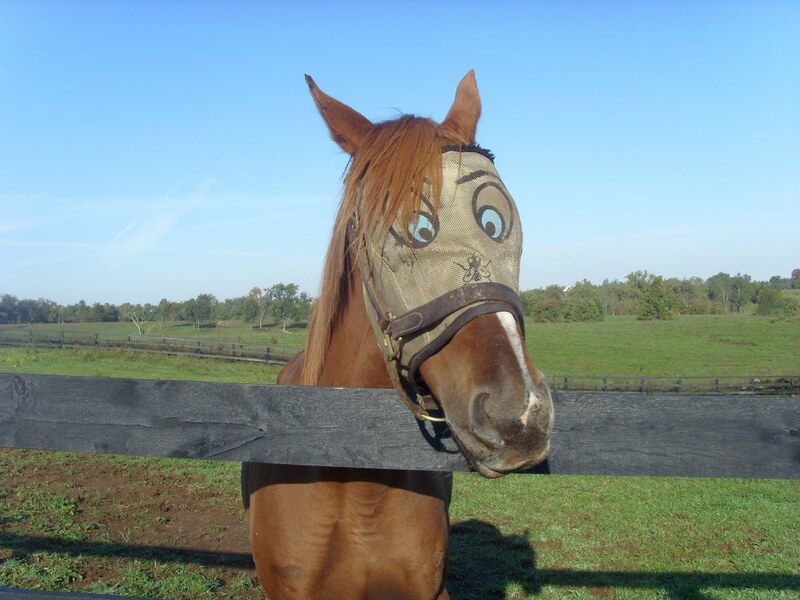 I hope that you get there before too long.Anon: certainly there are options for retired Thoroughbreds in New York; unfortunately, none are open to the public in the way that the Kentucky Horse Park and Old Friends are. Glimmerglass: Michael and I joined your tour when you were near Awad and Kiri's Clown; I was standing there as he talked about Precisionist. So sorry that we couldn't/didn't say hello! Teresa – if we were on the same tour, were you wearing the fur coat? ;> I would've been wearing the Rachel Alexandra hat while on the tour along with my wife.I can only hope that Mr. Blowen has continued success in being able to accomodate as many of these horses – some champions as he says and others he'll add having never earned but $100 – for years to come. As an aside – and certainly not an official position – I inquired at the office as to Lava Man. What I was told is the plan is that STD Racing will still send him there but only after this current foray of training and maybe another race start. Let's hope he too can find a paddock eventually to enjoy some of the Earth and get to be treated like "Elvis" as Michael said about Commentator at OF. Glimmerglass: Oh, yeah, definitely me wandering around in heels and a fur coat. 😉 I had on a gray fleece and a black velour cap. 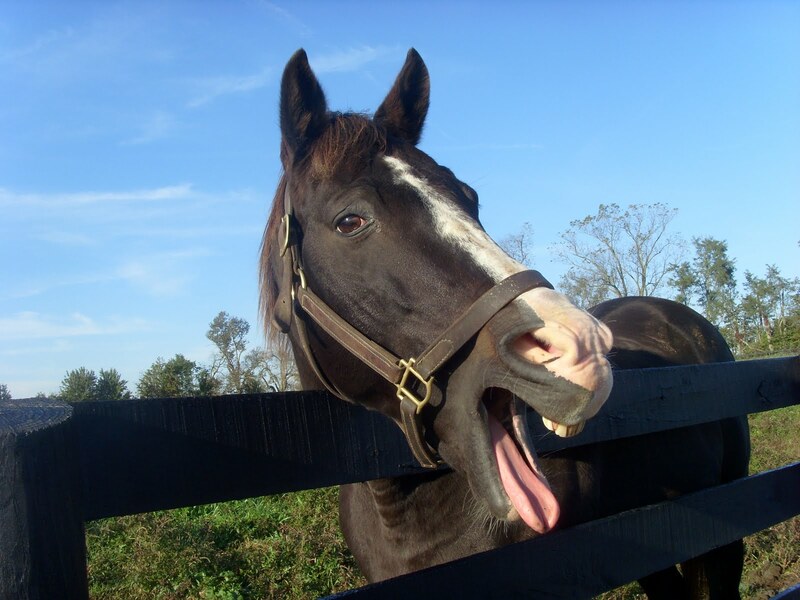 I think that Lava Man will indeed have a home at Old Friends. And if I had to bet, I'd guess sooner rather than later. teresa, i noticed that this post is on the PR Best of Blogs! For which, Sid, I clearly have you to thank! Thanks Teresa. Sorry I didn't see you on this trip, but there is always next time! Teresa and Sid…This looks like one of those make-up calls (from Paulick and Cummings) by a basketball ref when he makes a bad call at one end of the court and whistles a phantom foul at the other end. It's too obvious!But seriously, Teresa, you could have contacted me and said you were coming to Lexington so we could have a cup of coffee at the track kitchen one morning. I can't say that a similar analogy didn't occur to me, Ray–which in no way diminishes my appreciation for the extra eyes directed to my post because of the link. Thanks.And I will definitely get in touch for coffee at the track kitchen next visit. The amount of time that I spend in that place verges on embarrassing.